We've made an order for some seed potatoes with Alan Romans,* although they haven't arrived yet which is a little worrying. I expect it's just the bad weather holding everything up. This year I've decided to limit the number of varieties a little and grow more of our favourites but when I came across these blue all through potatoes in the supermarket over Christmas it seemed impossible to resist them. 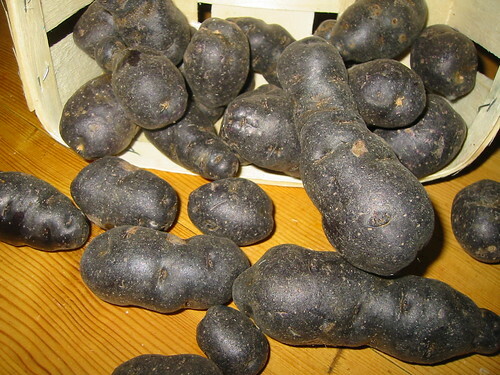 The Vitelotte noire, sometimes called Négresse du Poitou seems to be a very old variety, quite distinct from the Salad Blue which we've grown before by virtue of its longer and more knobbly shape and possibly an even darker blue black skin colouration. We've eaten a few, they seem unremarkable for flavour or texture but the colour and the novelty of the tubers has ensured that they have been preserved by small groups across France in the Auvergne and Brittany. There are references in the French literature to growers in the UK as well but I have to say I'd never come across them before chancing on this offering at Leclerc. This is a late maturing potato, of a long oval to sausage shape with half-sunken eyes. It is described at Le plant français de Pomme de Terre as a tall, upright grower entirely flushed with pigment and other sources suggest it is susceptible to all the usual diseases and blights that old varieties are prone to. So growing it this year as a novelty is to take a chance because these commercially produced tubers may not be virus or disease free but I'm going to give it a go because it'll make a change from the usual British cultivars. We are growing in France after all. * Update - I've had mail from Alan, they're swamped with orders but are working through them as fast as they can, so no need to panic. Probably the most important thing to note is that my seed didn't come from Alan Romans but from gleanings at the supermarket. They didn't grow well because it's French practice to treat retail potatoes with sprout inhibitor and they were quite probably carrying a high virus load too. Your seed potatoes shouldn't have any of these problems. There are updates on this site in June and September 2009 with some pictures of the foliage and the final crop which wasn't large. Good luck with your harvest.